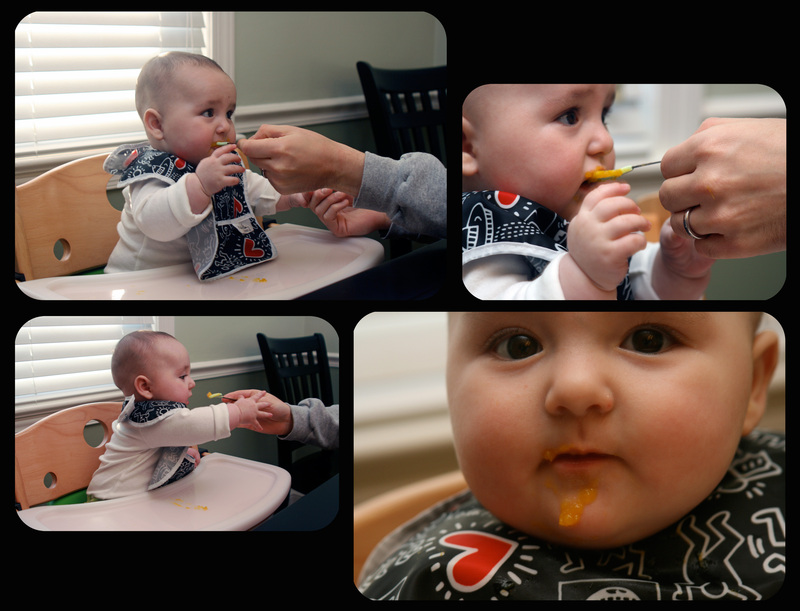 Darby started solid food on December 26, the day she turned 6 months old. The pediatrician told us to wait until 6 months to start solids so we did… and I had a great time counting down to her big day! See, I’m a total foodie. Not snob… more like nerd. I love eating food and cooking food and talking about food and reading about food and writing about food. I am intrigued and enthralled by food. So naturally I couldn’t wait to introduce my daughter to the wide world of food. Day 1 came. It didn’t go as I expected. Well, I shouldn’t say that… I guess day 1 went as I expected. Darby wasn’t sure of the weird goo in her mouth (butternut squash, by the way). She wasn’t sure of the spoon that was going in. It was all weird. But then day 2… and 3… and 4… all the same. I was so caught up in my own excitement that I totally underestimated how difficult introducing solids would be. Now a week later she’s definitely improving… meaning she only gags once during a meal. Introducing solids wasn’t only about her eating — it was also about me cooking. I couldn’t wait to cook for Darby. Yeah, I know that cooking right now means steaming or boiling some veggies but still. I get to COOK for her! Before I started, I poked around on some blogs and in some books for recipes. That’s when I discovered how silly baby food recipes are. Steam/boil. Puree. Mix with other pureed food/herb/spice. Feed. I need to buy a book for that? I don’t think so. I write a food blog called eatniks. Today, thanks to my friends at the WEBstaurant Store (the #1 restaurant supply store on the web! ), I’m giving away a food mill. (Go enter to win it!) A food mill just so happens to be a great tool for making baby food. The first thing I made (and the first thing I fed Darby) was butternut squash. I had a huge one and assumed it would make a ton of meals… and it did. I roasted it whole (poke holes in it, put on a baking sheet, in the oven at 425 for about an hour until it is soft) and scooped out the pretty orange center. Then into the food mill. Out came this silky smooth puree; those stringy fibers (that I actually had never noticed before) were left behind. Perfect. I didn’t need to add water or formula or anything to it. Next I did peas… the food mill squished out the soft center of the pea and left the shells behind. Perfect. As Darby gets a little more mature in the eating-solids-department, there are different plates with larger holes allowing the food to have more texture. You don’t have this kind of control with a blender or food processor. Plus chunks that could be a choking hazard don’t slip through the food mill — a chunk can definitely escape the blades of a food processor. In fact, I used my immersion blender on some broccoli. As I was scooping it into my ice cube trays, I caught a few big chunks. Be. Careful. I’m hoping to start feeding Darby the same things we eat for meals around 9 months (minus salt, sugar and heat of course), so I’m not spending too much time and effort thinking about creative purees for her. And really, I think making baby food is a good way to explore really basic flavor combinations that you like — for someone who wants to start cooking, this seems like a great place to begin. For example… butternut squash, apple and cinnamon. Yum. Peas with lemon zest and mint. Yes please. Broccoli, quinoa and basil. I’ll take two! Blueberries and oatmeal. Ok, you get the picture. Making baby food is really just pureeing foods and flavor combinations that you like. So here we are. Ten days into Darby’s life as a foodie. She has the whole world ahead of her and I can’t wait to introduce her to it. Hopefully she’ll want to cook with me. If she doesn’t, that’s ok. Hopefully she’ll be an adventurous eater like I am. If she isn’t… well, she better be.